The sun is shining brightly here today after our gloomy weekend and it is such a welcome sight to this native California girl. Something about it streaming through the windows just inspires me. 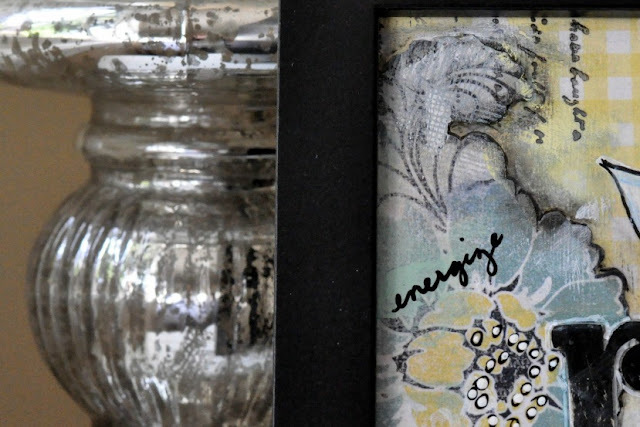 My house has been sadly neglected while I have buried my head in my studio so I think this week I will shut the craft room door and focus on a little sprucing up. I pulled some fabric (both vintage and new) out of my stash to make a few new pillows for the living room sofa. I am craving more color in there and I think that will do the trick. I still have a gift card to Home Goods from Christmas so I think I will head over there today and see if I can find a small lamp for the bookcase under the window. Refresh, energize, rejuvenate, flourish...that's my plan for this week. What's yours? Patty - Sounds like a good plan to me. That's kinda what I'm doing this week also. Along with sewing some new pillows. I know what you mean...I just finished taking down my Christmas tree because I have been so into my art these past few weeks. 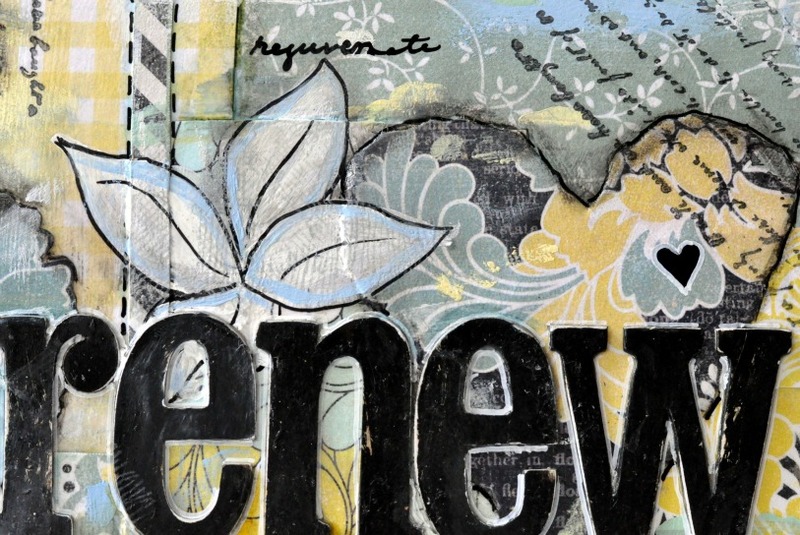 Love renew art. I am badly in need of a getaway weekend with hubby - renew, relax, and restore. I am having WAY too much fun getting my new craft room put together. I could probably blog about it everyday, but I know that gets a bit boring for everybody else. My house is struggling to stay presentable because of this. Oops! I probably should keep focused and keep the rest of the house appealing! Sounds like you've been enjoying yourself too! Have a delightful day! Love your beautiful Renew artwork! I have plans for doing some creating, organizing and spending time with family and friends (oh yeah... I forgot working too!) Have a great week. Have a lovely week and have fun with your house. I can not wait to see your freshening up re-do photos. Love your little "renew" picture. Very pretty! Your plan sounds so wonderful. You are way far ahead of me. I am just trying to stay above water. This Californian girl is going to try to send more sunshine you way!! 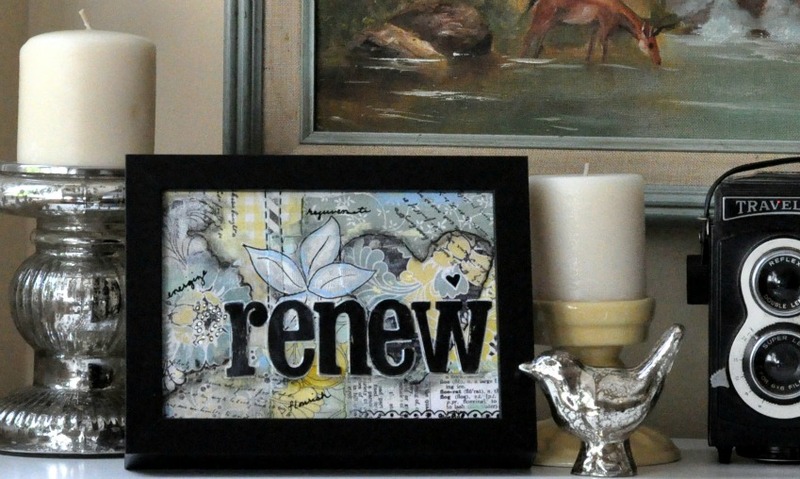 I love your picture for the word Renew. I choose a word for the year, also. My word for 2013 is Filled. I'm into the refresh and reorganize. One problem is I tore two rooms apart and now can't settle on what to keep and what to get rid of. I want to keep everything but it just doesn't fit back in the way I want a refreshed room to look. Oh my, I have company coming this weekend so I best get a move on it!!! That sounds like a great plan...refresh!!! Your creative side has produced such great things...now this week I am preparing for a son's birthday party. You gave me a giggle today!!! Seems I'm head long into Studio One or head long into the Upper Level here On Crooked Creek...all the while the other suffers terribly!!! Livin' life, huh??? That being said...I'm heading to Studio One...to renew a bit more!!! So pretty and great saying! 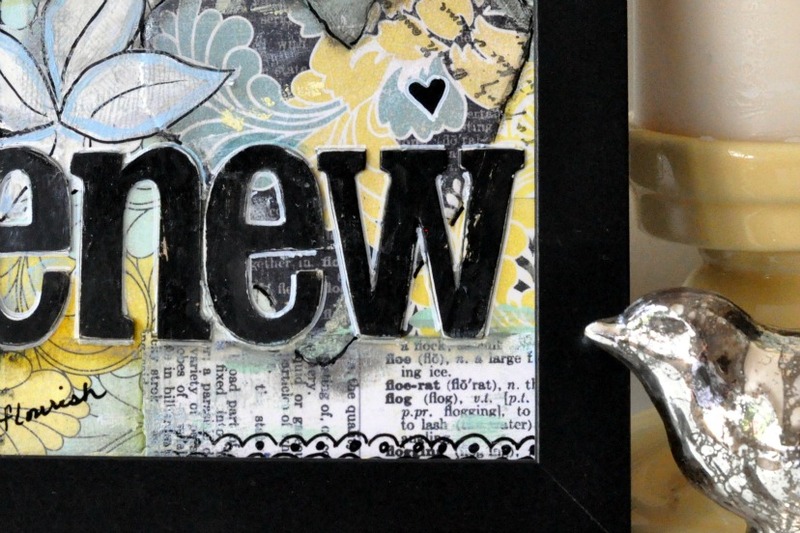 Renew, makes me think of Spring!